Indonesia is a remarkable case study for religious politics. While not being a theocratic country, it is not secular either, with the Indonesian state officially defining what constitutes religion, and every citizen needing to be affiliated to one of them. This book focuses on Java and Bali, and the interesting comparison of two neighbouring societies shaped by two different religions - Islam and Hinduism. 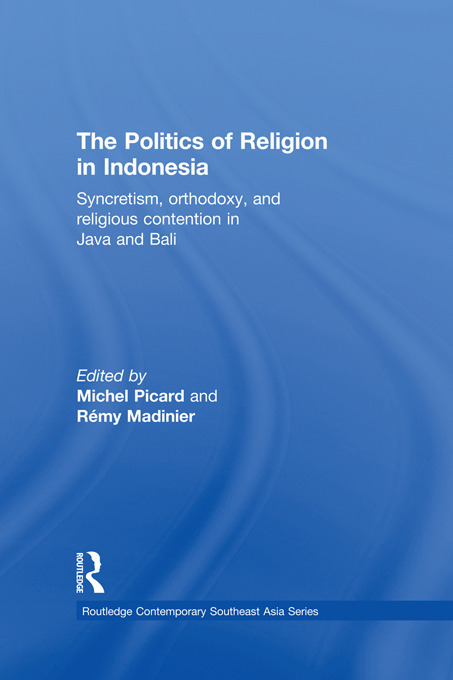 The book examines the appropriation by the peoples of Java and Bali of the idea of religion, through a dialogic process of indigenization of universalist religions and universalization of indigenous religions. It looks at the tension that exists between proponents of local world-views and indigenous belief systems, and those who deny those local traditions as qualifying as a religion. This tension plays a leading part in the construction of an Indonesian religious identity recognized by the state. The book is of interest to students and scholars of Southeast Asia, religious studies and the anthropology and sociology of religion.